Consider doing a brick workout, which involves “stacking” one workout on top of another (and potentially making your legs feel like bricks afterward). You can set up your transition just like you would in a race. Even if you’re not doing a formal brick workout, you can still rehearse your transition. It’s no different or less critical than any other race prep. 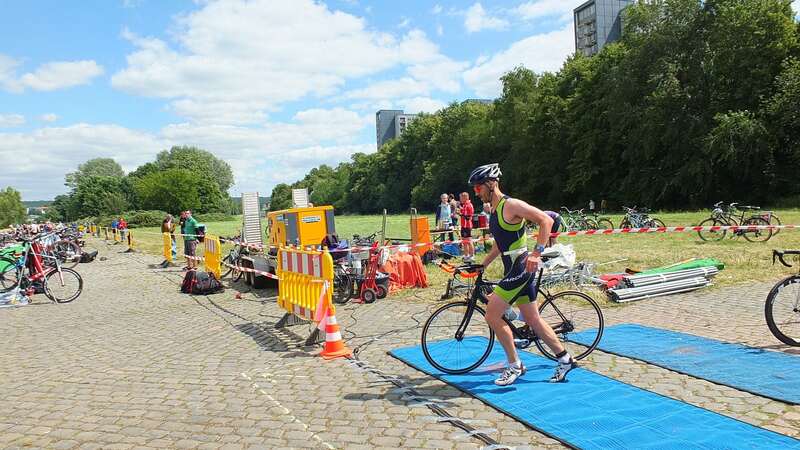 Don’t have a triathlon on the horizon? You can still benefit from mixing up your training with a combo workout. Make sure you have these items when transitioning from the swim. First and foremost, you need your helmet. Many triathlons require you to have your helmet on in the transition stage, regardless of whether you’re on your bike or not. It’s also helpful to ride with sunglasses (so you’re not squinting for the duration of your ride) and cycling shoes. Obviously, your race number belt is critical, as well as any nutrition you plan to take while on the bike. Also make sure you have a full water bottle in the cage on your bike before the triathlon starts. You want to have everything as ready as possible before you start the swim. Gear up appropriately for your run. Shoes are probably the most critical element for the running stage, so make sure you’re fitted properly and comfortable with your shoe choice. Other must-haves include moisture-wicking socks, nutrition products (make sure you test these in your training) and a hat or visor (great for shielding your eyes from the rain or sun). For a lot of races, you won’t have much room to lay out your gear, so be sure to have everything consolidated. For example, when transitioning from swim to bike, have your sunglasses in your helmet so you don’t forget them in T1 (the first transition phase). Also, if you’re switching from cycling shoes to running shoes in T2 (the second transition phase), put your preferred nutrition and a pair of dry socks in your running shoes. If you plan to wear a hat for the run, lay it on top of your shoes and put your sunglasses in your hat. If, despite all of your preparation, your transition doesn’t go as smoothly as planned, shake it off and keep going. What’s important is that you’re out there giving it your all, so kudos to you for getting after it!